Both sides of the political aisle are prone to exaggeration and convenient amnesia. Recent discussions of Obama’s plan to allow the Bush tax cuts to expire have included references to socialism. 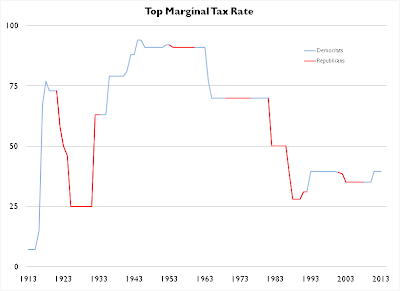 Below you will find the historical top marginal income tax rates, color coded by party. Another take is here. [Data Source].